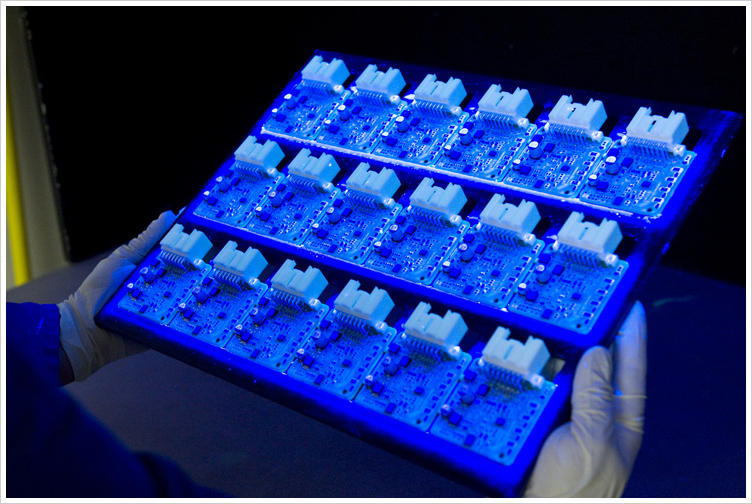 New vapor phase reflow soldering process, our latest supplier performance award and our new recycling program, plus recaps the successes of the past year. 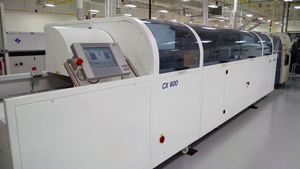 Firstronic LLC has enhanced its manufacturing processes with the addition of an IBL CX600 vapor phase soldering system. 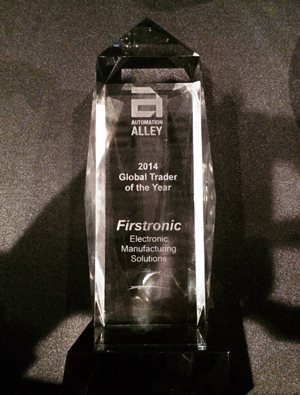 Firstronic wins Global Trader of the Year award, Jose Cortez promoted to Program Manager, Juarez, Mexico facility in production and its leadership team in place, and Firstronic Hosts MiDevice Medical Consortium meeting. 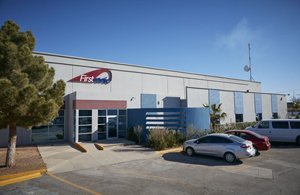 Firstronic LLC’s 70,000 square foot facility in Juarez, Mexico began production qualification runs this month. Facility preparation was completed earlier in September and the first two SMT lines have been installed. 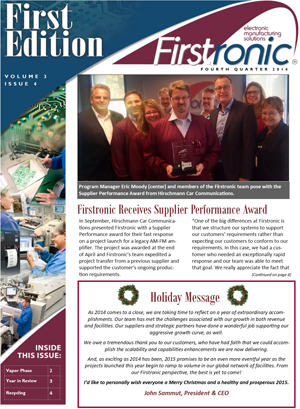 Firstronic’s Made in USA success story was recently featured in a three-part series of articles in Industry Week. Click on each article title to download. 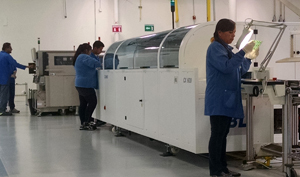 Part I – Who Says You Can’t Manufacture Electronics in the U.S.
Part II – Workforce and Lean Strategies Help Keep Manufacturing in the U.S.
Firstronic LLC is launching a 70,000 square foot facility in Juarez, Mexico and has begun the facility preparation. Equipment installation is scheduled in mid-August and the facility should be fully operational early in September. 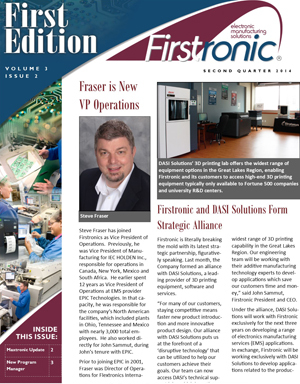 Steve Fraser is named VP Operations, strategic alliance with DASI Solutions announced, Maxtronic JV success stories grow, Eric Moody named Program Manager, Firstronic press coverage expands and a unique approach to customer satisfaction measurement gives more members of each customer’s team a voice. Firstronic LLC has formed a strategic alliance with DASI Solutions, a leading provider of 3D printing equipment, software and services. 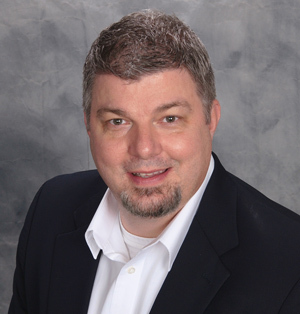 Steve Fraser has joined Firstronic LLC as Vice President of Operations. Previously, he was Vice President of Manufacturing for IEC HOLDEN Inc., responsible for operations in Canada, New York, Mexico and South Africa. 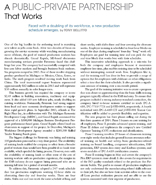 Faced with a doubling of its workforce, an innovative training and production schedule was developed. 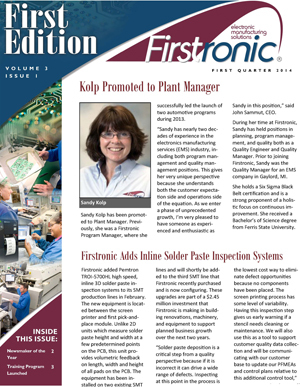 Sandy Kolp promoted to Plant Manager, automated SPI equipment added, industry-leading training program developed, inventory turns have doubled, Firstronic selected as GRBJ Newsmaker of the Year finalist and website redesigned. 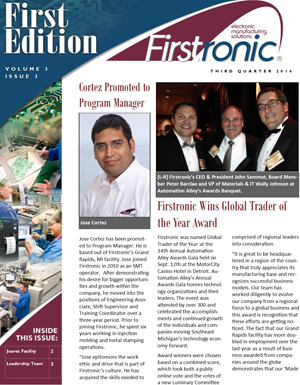 While Firstronic LLC has traditionally supplied the automotive industry with components for lighting controls, various sensors and control modules, the company is increasingly finding a niche in serving the burgeoning medical device sector, said CEO John Sammut.